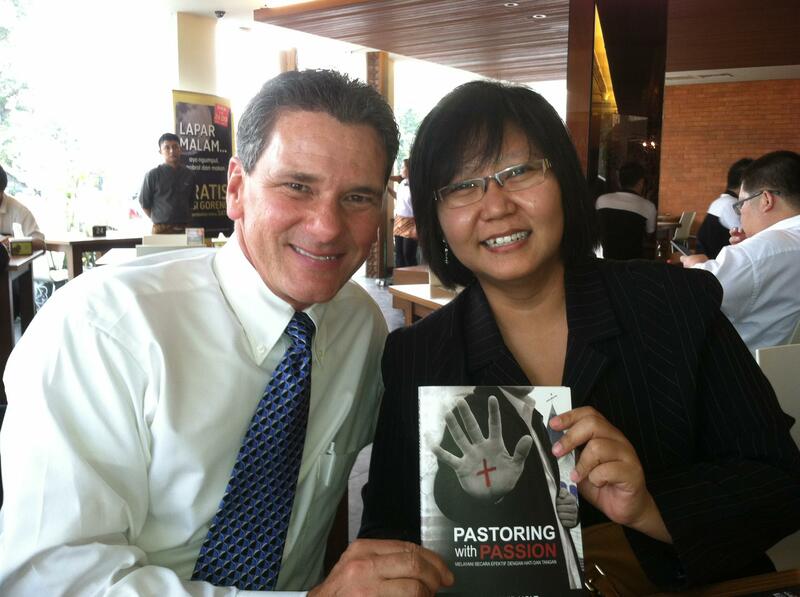 Pastoring With Passion – Ministering Effectively With Heart and Hands. 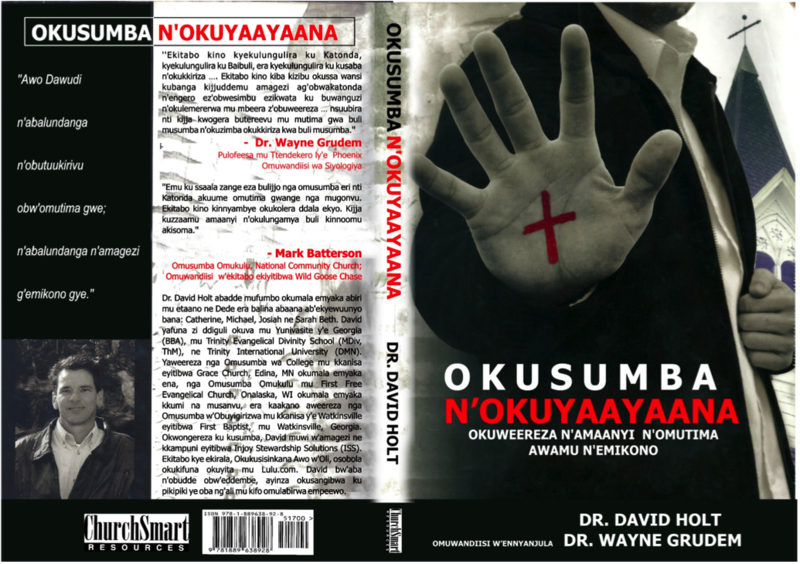 Now translated into Ugandan. Still looking for a printing partner. 1. First Things First – Passion for God. 2. Starting At Home - Passion for Family. 3. No Greater Privilege – Passion for the Church. 4. Fatal Flaws and Wet Blankets – Passion for Purity. 5. An Open Window with a Good Screen - Passion for the Word and the Spirit. 6. Embrace Your Weakness – Passion for Humility. 7. Wearing the Right Hat – Passion for Identity. 8. Thus Saith the Lord – Passion for Preaching. 9. Not a Sermon Warm-Up – Passion for Worship. 10. Seeing God in Tangible Ways - Passion for Buildings and Capital Campaigns. 11. Don’t Give Up – Passion for Perseverance and Longevity. I first met David Holt over twenty years ago, when he was a student in some of my theology classes at Trinity Evangelical Divinity School in Deerfield, Illinois. He was an excellent student academically, but in addition to that, it was evident from his life that David deeply loved God and was totally committed to obeying Him in every area of life and ministry. I also saw those same qualities in David’s wonderful wife Dede, and I expected that eventually God would give significant blessing to their future ministry, wherever it might be. Now I have read with great interest this remarkable book of David’s about pastoral ministry, and I see that my former student has become an exceptionally wise and winsome teacher, a mature pastor who has immense wisdom and encouragement to offer to other pastors. After David graduated from Trinity in 1990, he became the pastor of a small Evangelical Free Church in La Crosse, Wisconsin, a church that was around 100 years old and had shrunk to about 80 people. Eventually I had the joy of preaching for David in that church and staying in the Holt’s home, and I saw how he was ministering faithfully to his people. Over the years, I have talked with and corresponded with David about some of the really tough times and some of the times of great joy that he encountered in that ministry. On more than one occasion I have mentioned David’s name to various pastoral search committees from other churches, but he refused to leave La Crosse, believing that God had called him to remain there for a long time. As it turned out, he ministered in La Crosse for seventeen years, and saw great blessings from God on his ministry. As is evident from story after story in this book, David is a man of high personal integrity, deep love for God, a strong sensitivity to Holy Spirit’s guidance, a complete submission to the entire Bible, and a deep commitment to prayer. As you read these pages, I believe you will be challenged in one area of your life after another as David explains what it takes to be faithful to God in the various components of pastoral ministry. This book is God-centered, Bible-centered, and prayer and faith-centered. Time and again it highlights the genuinely spiritual nature of all lasting ministry. The book is hard to put down because it is so filled both with godly wisdom and with honest stories of successes and failures in ministry situations. This book is filled with practical wisdom from a godly, gifted pastor. I expect that it will speak directly to every pastor’s heart and build up every pastor’s faith. "I love the ministry and being a pastor. There is no greater calling, but sometimes it can feel like a burden. We all need a book like this to remind us of what a privilege it is to serve others and to rekindle our love for God and his children." "Pastor David Holt served with distinction as the Senior Pastor of a dying church that came alive under his leadership. During his tenure, the church grew from a small, struggling church to well over 1000 in attendance with a dynamic multiple staff and ministry. His journey as a pastor will challenge and encourage you. You may not agree with everything but allow yourself to interact with the principles he clearly lays out. We need more pastors with the right passions! "This book comes from the heart of a pastor to the hearts of other pastors. It stresses one of the most unforgivable flaws for a shepherd of God’s flock – the lack of passion. All other things being equal, without passion a pastor, no matter how great his gifts are, is doomed to failure. I began pastoring over 50 years ago and have been pastoring or teaching pastors ever since. I deeply regret that I did not have this book to guide me. It is a must read for every pastor, no matter how small or how large his church is." "One of my consistent prayers as a pastor is that God would keep my heart soft. This book helped me do just that. It will encourage and inspire everyone who reads it." "David Holt's manuscript on passion in pastoral ministry hits a critical note which needs to be sounded in the contemporary discussion on where we are and where we need to be going. Coming out of the heat of 17 years in a remarkable "turn-around" local church experience, he writes clearly and practically. As a long-time professor at TEDS in this area, I heartily endorse his work." "I have known David since high school and have kept up with his ministry for over 20 years. David has invested himself in one congregation for seventeen years. He knows what he is talking about when he writes about Pastoring With Passion. Passion for God and his flock causes this book to come from his heart and it will encourage and challenge yours." Author; Founder/President of Reach-Out Ministries, International, Stone Mountain, GA.
"You hold in your hands not simply a book, but a life. David has taken his journey in ministry and distilled it into a single volume that reflects his passion and mission. Allow his life to touch yours." "This book has the potential of ‘jump starting’ a new pastor into the sacred task of shepherding a flock. The author has a good blend of piety, pastoral skills, personal and ministry priorities and pragmatic advice which comes from years of successful ministry and family living. I also commend this book to seasoned pastors for a ‘tune up’ ... understanding that we all have blind spots, dry times and forgetting things we used to know! Thanks, Dave, for good work!" "I work with about 100 churches in Wisconsin and upper Michigan, with a combined pastoral staff of over 220. David Holt, while he was in this district, was one of just a few whose ministry attracted me like a moth to a flame. The reason could be summed up in one word: passion. I am thrilled that David is sharing the passion of his heart for the pastoral ministry in a form that many will benefit from, and pray that this book will raise up an army of passionate pastors like him. If it does, the Church will be richer and better equipped for it." 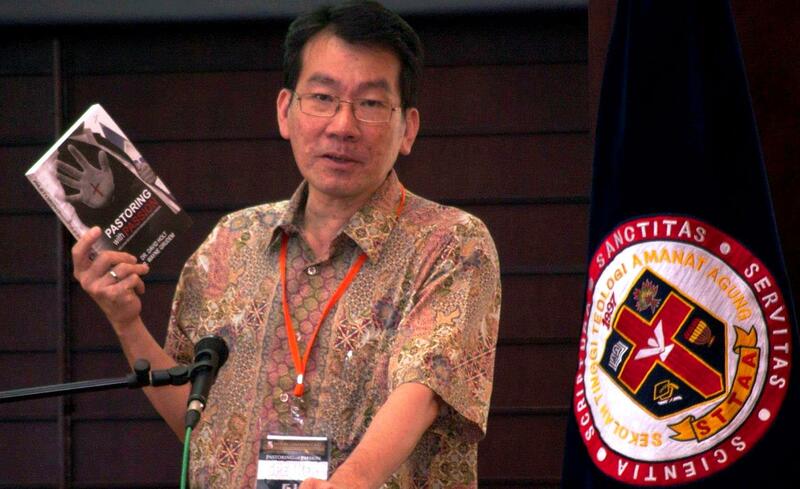 "I would give anything if I had such materials as are in this book to inspire and inform me when I began this wonderful journey in ministry six decades ago. But I have it now and will recommend it to preachers young and old as a replete guide for a passion-filled ministry. It will be a helpful addition to whatever education one may have and a ready reference of helps in every venue of a pastor's life. Kudos to David Holt for a job well done!" That's the way I feel about this superlative book written by my friend and colleague in ministry, David Holt. I not only wish I had said it, I wish I could have read it almost a half century ago when I was beginning my pastoral ministry. This is a much needed book. I believe that God has raised up David Holt as His chosen instrument for Kingdom advancement and enhancement ‘… for such a time as this!’"
"From his rich pastoral experience David Holt passes on principles of effective ministry that are foundational to congregational health and growth. His insights are both theologically grounded and contextually workable. His chapter on Passion for God, including his discussion of spiritual love languages, is alone worth the cost of the book. 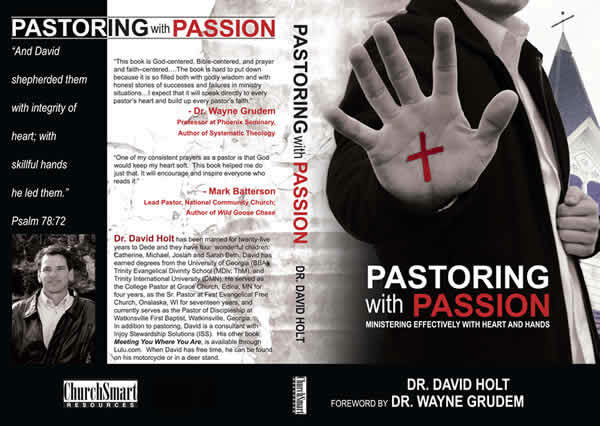 Pastoring with Passion is a recommended read for young pastors, as well as veterans." Pastor for 17 years; Author of nine books; Professor of Ministry Leadership at Bethel Seminary (22 years), St. Paul, MN; and Executive Director of Ministry Transitions, Inc.
I’ve known David Holt for over ten years and have served as one of his associate pastors for the last four of those years. I have watched him from the "inside" live out, on a daily basis, what he writes about in his book, Pastoring With Passion. Having been in the pastorate for almost forty years, I can say with all confidence that David is the consummate pastor. I believe that what he has to say to young (or maybe not so young) pastors could be invaluable to their understanding of and growth in what it means to be called "pastor." "What we need today are real pastors who present a real gospel with real passion! David is such a pastor and leader. Through his personal experience of pastoring a growing congregation every week for over seventeen years, David unpacks the most important convictions that every pastor must have to be effective in the 21st century. I applaud David for keeping the main and plain so practical and helpful. Any pastor who longs to minister with power and passion should read this book. Plus, he’s my brother and I know that he lives what he preaches." "There is some worth to hearing theoretical advice about what it means to ‘pastor’ in today’s changing world, but then there is the immeasurable value of hearing from those who have truly carried the mantle of pastor. David has faithfully worn this mantle for many years, and out of his experience he is able to connect with the challenges and reality of what we truly face in the ministry landscape. Within these pages, I read of the same heart and passion for pastoring that were visibly on display in our years of working together. As you read may God also stir up in you an increasing passion to serve Jesus Christ, the Head of the Church." "Pastor David Holt is a man who believes that life is to be lived with passion. He effectively communicates his passions for the Lord Jesus and for Christian living and ministry in this practical and inspirational book, Pastoring with Passion. Pastor Holt addresses the Biblical passions that are to motivate and shape all of the key areas of the Christian’s life and ministry. Pastoring with Passion is written for both pastors and dedicated laypersons who want to appropriate more deeply the divine graces we each need to grow in effective ministry. Those pastors and laypersons who are struggling in their walk with Christ or who are discouraged with a lack of effectiveness in ministry will find Pastoring with Passion a wonderful spiritual guide out of frustration and malaise into the intimate personal love relationship with Jesus Christ that makes the Christian life both a wonderful journey and a rewarding experience. His disarming transparency about his own personal struggles in ministry and the practical suggestions he provides for addressing these struggles in our lives both make David Holt’s Pastoring with Passion a refreshing and prudent guide for all Christians whatever their level of maturity or their ministry position in their church. Readers will find this book Biblically based and laced with the wisdom gained through years of pastoral experience and caring for people. As a Pastor and friend to all who desire to be more effective in personal ministry, I urge you to read devotionally and reflect carefully upon Pastoring with Passion." So, here you are with yet another book to litter your desk or further burden your already crammed bookshelves. And you are asking yourself, "Why should I expend some of my precious time – of which I don’t have enough – to read this book?" Well, I have good news for you: This book is not meant to be read from cover to cover. Review the Table of Contents and find the chapters most relevant to you right now, and read only those. This won’t take you long. Then, months from now you, you can read other chapters as they become relevant. Most pastors do not have the time to read entire books, anyway, so I am giving you permission to skip those chapters which fail to scratch where you are itching. As a fellow pastor, I know first hand that pastoring is one of the most complex professions in the world – calling for the wisdom of Solomon, the courage of Daniel, the strength of Paul, and the deity of Christ. I want to help. I love pastors and appreciate the unique challenges they face. I desire to come alongside and encourage you. 1. Want to be the most effective pastor you can for the glory of God. After all, that is what made you say "yes" to the calling in the first place. 2. Find your passion for God getting smothered by the demands of ministry. 3. Are overwhelmed and exhausted from pastoring. The "passion" which brought you into the pastorate is not the passion you are currently experiencing. Your spiritual battery needs a jump start. 4. Have become disillusioned with the church and need a fresh reminder of what a privilege it is to be a pastor. 5. Have grown a bit "weary in well-doing" (Galatians 6:9). 6. Need some encouragement from someone who has "been there, done that." Isn’t the brotherhood we have as pastors a special thing? 7. Are a young pastor and experiencing situations in which seminary did not prepare you. 8. Minister in your local church as a lay person and want all the help you can get. 9. Work for a para-church group, but haven’t found many books that help you. 10. Love your pastor and want to know how you can more effectively support him. By the way, if that’s you, let me say this: I especially like your types! We pastors need people like you to encourage us. 11. Are preparing for ministry and want to get started on the right foot. In this book I share my heart with you. Manuals covering about every aspect of pastoring are available today. I do not seek to replicate those books. Though I will be immensely practical on some issues, I am mostly interested in those areas I regard as the heart of the pastorate, such as, having a passion for: God, our family, the body of Christ, personal purity, the power of the Holy Spirit, genuine humility, preaching, worship, our true identity, leadership development, longevity, and even buildings and capital campaigns. I invite you to walk with me through a few of these most important aspects of pastoral ministry. Each chapter includes with some questions to ponder and resources to consider. I reflect on my 17 years as the senior pastor of one church and four years as the college pastor of another church. I want to speak to your heart as well as equip your hands. I almost titled this book "Pastoring With Heart and Hands." I pray God uses this book to stir YOU to pastor with greater passion and shepherd with greater skill. Since I am calling you to pastor with greater passion, let me clarify what I mean by the word "passion." Those who conclude passion is merely emotional, and this book is only for those "touchy-feely" types, will be wrong. Certainly a passion for God involves our emotions. Jesus said to love the Lord our God with all our heart, soul, mind and strength (Mathew 22:37). Heart and soul touches on our emotions. However, passion in this book will go much deeper than emotion. . I will use the word "passion" as follows: Being deeply committed to something so you give it your all. Passion engages the heart and moves the will to action. Passion chooses the right course even when the feelings are absent. You want to be all God wants you to be. You want ministry to be an extension of your life. You do not want to merely "play the part." You are committed to God, your family, your purity, and your flock. You desire to hear, "Well done" at the end of your earthly pilgrimage. This is what it means to pastor with passion. But this book is not just for pastors. The first day I began writing this book, my mother-in-law stopped by. I showed her my outline. Her comment was, "Don’t just make it for pastors. Anyone involved in ministry would benefit from this book." I agree with her and hope many servants in the body of Christ will benefit from this book, even if they are not in a formal "pastoral" position. My prayer is that this book will touch your heart and change your life. Most of us do not need another book, but we do need a touch from God’s Spirit. May this book be fresh manna for your spirit. "God, I want to walk closer with You and experience all You have for me. Thank You for the amazing privilege to be in ministry. Reveal to me the two or three things You most desire for me to take away from this book." If you do this, and follow through on those two or three things, then I will consider the labor of love in writing to have been well worth it. I have sought to bathe this book in prayer. I have asked God to make my keyboard the "pen of a ready writer" (Psalms 45:1). As you read, ask God to specifically speak to you and change YOUR life for His glory. To that end I entrust this book to you. Please let me know how God uses it in your life.